CARIGARA, Leyte – Over 180 employees of the Department of Public Works and Highways (DPWH) Leyte Second district engineering office participated during the 1st Nationwide Simultaneous Earthquake Drill (NSED) for 2019 held on February 21 at around 2 pm. The Municipal Disaster Risk Reduction and Management Council (MDRRMC) of Carigara, Leyte led the simultaneous drill, demonstrating evacuation procedures and emergency protocols. Afterwards, a one-minute alarm signaled the actual earthquake evacuation drill. According to Gerald A. Pacanan, DPWH Leyte 2 district engineer, this activity will boost the awareness and preparedness of employees during disaster especially that the province is at risk to earthquakes because of the Central Leyte Fault line. He also expressed his support on this campaign by forming a permanent medical, evacuation, and inspection response team and committing to equip the district with the necessary tools and facilities to safeguard the lives of the employees. “This is a serious matter, so we must have the proper knowledge on dealing with situations like this and set up a system for immediate response within our premise,” he added. 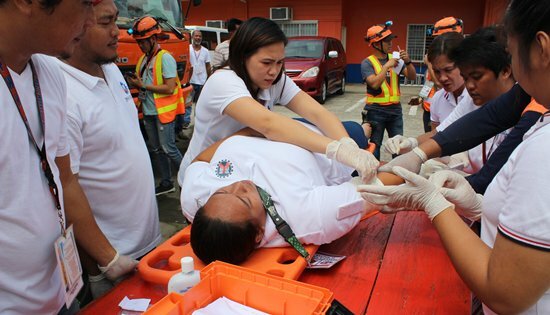 As per order from DE Pacanan, the district will tap the MDRRMC of Carigara for first-aid and emergency response training as soon as possible to intensify the disaster preparedness of the district. “This would be beneficial not only to us, but also to our friends and immediate relatives who we can share our learnings to from this training. Afterall, DPWH is also a key player and an immediate responder during earthquakes and other natural calamities.” he ended. As the infrastructure agency of the country, the highways department is also committed in building safe and disaster-resilient public facilities. The NSED is a quarterly activity spearheaded by the NDRRMC and its local counterparts that aims to strengthen timely and appropriate responses during earthquakes and other similar events.